T Hasan. 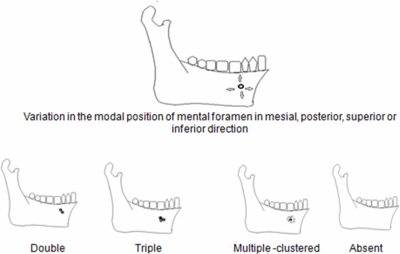 Characteristics Of The Mental Foramen In Different Populations. The Internet Journal of Biological Anthropology. 2010 Volume 4 Number 2. The mental foramen is an oval or circular opening on the anterior surface of the mandible; through which the mental bundle exits and innervates the ipsilateral chin, lower lip and gingiva. Mental foramen is the determinant of the mental triangle and forms an important landmark of the human mandible. It holds strategic importance during invasive and non invasive procedures of the mandibular region. It is considered a highly suitable model to study bone remodeling activity and the maturity pattern of the human mandible.Its modal position varies according to age and race and has been cited ranging from sub canine to sub molar in different populations. Variations like multiple or absent foramina are often encountered. These variations in the position and number of the mental foramen have been reported to exhibit a clear racial trend in the pattern of their occurrence.Recent advancements in clinical dentistry have increased the possibility of procedures in the mental region and a detailed knowledge of the mental foramen anatomy may not only aid in the prevention of post surgical neurovascular complications and morbidity; but also hold the potential of contributing as an identifying maxillofacial anthropologic characteristic feature for different populations. The awareness of its typical morphologic features in different ethnicities is pivotal for anatomists, ortho-dentists, surgeons and paleoanthropologists alike and a more elaborate mention of the same in our standard anatomy textbooks would be a welcome change. The mental foramen is a strategically important landmark during osteotomy procedures, anesthetic nerve blocks and prevention of neurovascular complications after invasive procedures on the lower jaw. Its anatomy is important for evaluating the morphometric symmetry of the mental triangle, microscopic and macroscopic morphology and maturity of the human mandible, bone remodeling activity and paleoanthropologic features of the facial skeleton in different populations. This review elucidates the population based characteristic morphologic features of the mental foramen. Caucasoids: It was more medially located, between first and second premolars. A lot of research done in the past highlights the genetic and racial influence on mental foramen variations. In 1970; Kadanoff et al demonstrated the variations in the number of mental foramina ranging from being absent to double or triple; equal or unequal sized; close or widely separate or even multiple; in the form of a cluster.27 Identifying these variations by a prior digital scan may reduce the incidence of post procedural paralytic and hemorrhagic complications in the mental region, thereby significantly reducing morbidity. Detection is possible by macroscopic inspection of dry mandibles, plane or periapical radiography or computed tomography scans. However, radiographic localization is difficult due to lack of consistent anatomical landmarks for reference, and the foramen cannot be clinically visualized or manually palpated. The foramen may not appear on conventional radiographs, and linear measurements need to be adjusted to account for radiographic distortion and discrepancies in the findings. Computerized tomography (CT) scans are usually more accurate. Sometimes, an anterior loop of the mental nerve may be present mesial to the mental foramen and may cause mental nerve injury during dental implants.44 Guidelines to verify the position of the mental foramen and validating the presence of an anterior loop of the mental nerve while establishing a zone of safety (in millimeters) for implant placement can avoid such nerve injury. Furthermore, radiographic assessments result in a high percentage of false negative findings. These false findings can cause sensory dysfunction due to inferior alveolar nerve damage in the foraminal area. The foramen may occasionally misdiagnose with a radiolucent lesion in the apical area of the mandibular premolar teeth. Additionally, local anesthesia of the terminal incisive branches of the inferior alveolar and mental nerves can be obtained effectively if the mental foramen is correctly identified. Therefore, computerized tomography (CT) scans are more accurate for detecting the mental foramen than conventional radiographs. The recent trend of replacement of missing teeth by dental implants and the increasing frequency of orthognatic surgeries have highlighted the clinical significance of the mental foramen. Mental foramen variations often remain unnoticed and undiagnosed. Even so, in order to obtain effective nerve block and to avoid post-procedural neurovascular complications in the mental region, particular attention should be paid to the morphology of the mental foramen. A prior CT scan can elucidate jaw structures and prevent patient morbidity. Therefore, a detailed knowledge of the mental foramen anatomy and it's variations in different populations is essential for dentists, orthopedicians and anatomists alike. A future prospect of interest lies in their possible contribution to the maxillofacial anthropologic characteristic identification for different populations and races. A more elaborate mention of its population based morphology and clinically relevant variations in our standard anatomy text books would be a welcome change. 1. Williams P L,Bannister LH, Berry MM., Collins P,Dyson M, Dussek, J. E. Gray’s Anatomy: The anatomical basis of medicine and surgery. 38th Ed. NewYork, Churchill Livingstone; 2000. 3. Haghanifar S, Rokouei M. Radiographic evaluation of the mental foramen in a selected Iranian population. Indian J Dent Res. 2009; 20: 150-152. 4. Zivanovic S. Some morphological characters of the East African mandible. Acta. Anat.1970; 77:109-119. 5. Green, R. M. The position of the mental foramen: A comparison between the Southern (Hong Kong) Chinese and other ethnic and racial groups. Oral. Surg. Oral. Med. Oral. Pathol. 1987; 63:287-290. 6. Santini A, Land M.A. Comparison of the position of the mental foramen in Chinese and British mandibles. Acta.Anat. 1990;137:208-212. 7. Sawyer DR, Kiely ML, Pyle MA. The frequency of accessory mental foramina in four ethnic groups. Archives of Oral Biology. 1998; 43: 417-420. 10. De Freitas V, Madeira MC, Toledo Filho JL, Chagas CF. Absence of the mental foramen in dry human mandibles. Acta Anat (Basel). 1979; 104: 353-355. 12. Souaga K, Adou A, Angoh Y. Topographical and morphological study of the mandibular foramen in black Africans from the Ivory Coast. Odontostomatol. Trop. 2004 ;27(105):17-21. 14. Phillips JL, Weller RN, Kulild JC. The mental foramen: Part II. Radiographic position in relation to mandibular second premolar. J of Endodontics 1992; 18: 271-274. 15. Weller RN,Phillips JL., Kulild JC. The mental foramen: Part III. Size and position on panoramic radiograph. J of Endodontics 1992; 16: 383-386. 16. Lindh C, Petersson A, Kling B. Measurements of distances related to the mandibular canal in radiographs. Clin Oral implant Res. 1995 ; 6 : 96-103. 17. Ari I Kafa IM, Basar Z, Kurt M A. The localization and anthropometry of mental foramen on late Byzantine mandibles.Coll. Antropol. 2005;29:233-236. 18. Oliveria J E M,. Arajo, A. L. D, SilvaC. M. F,Sousa R C F, Lima FJC. Morphologicaland morphometric study of the mental foramen on the M-CP-18 jiachenjiang point. Int. J. Morphol. 2009; 27(1):231-238. 19. Fabian FM. 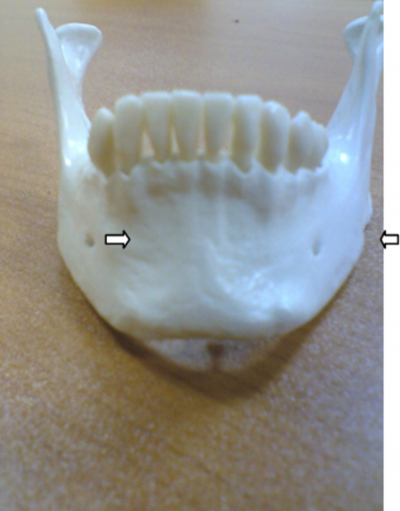 Position, shape and direction of opening of the mental foramen in dry mandibles of Tanzanian adult black males.Ital J Anat Embryol. 2007; 112(3):169-177. 20. Cutright B,Quillopa N,Schubert W. An anthropometric analysis of the key foramina for maxillofacial surgery. J. Oral. Maxillofac. Surg. 2003; 61:354-357. 22. Ilayperuma I, Nanayakkara G, Palahepitiya N. Morphometric analysis of the mental foramen in adult Sri Lankan mandibles. Int. J. Morphol.2009; 27(4):1019-1024. 23. Mbajiorgu EF, Mawera G, Asala SA, Zivanovic S. Position of the mental foramen in adult black Zimbabwean mandibles: a clinical anatomical study. Cent Afr J Med. 1998 ;44:24-30. 24. Igbigbi PS, Lebona S. The position and dimensions of the mental foramen in adult Malawian mandibles. West Afr J Med. 2005;24:184-189. 25. Oguz O,Bozkir M. G. Evaluation of location of mandibular and mental foramina in dry, young, adult human male, dentulous mandibles. West Indian Med. J. 2002; 51(1):14-16. 26. Taiseer AK,Abed AH, Hamasha KTA. Position of the mental foramen in a northern regional Jordanian population Surgical and radiologic anatomy.2007;29(3): 231-237. 27. Kadanoff D, Mutafov ST, Jordanov J, Über die Hauptöffnungen resp. Incisurae des Gesichtsschädels (Incisura frontalis seu Foramen frontale, Foramen supraorbitale seu Incisura supraorbitalis, Foramen infraorbitale, Foramen mentale). Gegenbaurs Morphol. Jahrbuch ,1970;115:102-118. 29. Toh H, Kodama J, Yanagisako M, Ohmori T. Anatomical study of the accessory mental foramen and the distribution of its nerve. Okajimas Folia Anat Jpn. 1992; 69: 85-87. 30. Soikkonen K, Wolf J, Ainamo A, Xie Q. "Changes in the position of the mental foramen as a result of alveolar atrophy". J Oral Rehabil. 1995;22: 831–3. 33. Madeira C,Percinoto M, Das G, Silva M.. Clinical significance of supplementary innervation of the lower incisor teeth: a dissection study of the mylohyoid nerve.Oral Surg Oral Med Oral Pathol. 1978;46: 608–614. 34. E. Kaufman N, Serman J , Wang P.D. Bilateral mandibular accessory foramina and canals: a case report and review of the literature, Dentomaxillofac Radiol . 2000 ;29 :170–175. 35. McDonnell D, Nouri M.R. ,Todd M. The mandibular lingual foramen: a consistent arterial foramen in the middle of the mandible, J Anat .1994; 184:369–371. 37. McGregor JA,MacDonald .G, Patterns of spread of squamous carcinoma within the mandible. Head Neck Surg .1989; 11: 457–461. 38. J.A. McGregor and D.G. MacDonald, Routes of entry of squamous cell carcinoma into the mandible.Head Neck Surg.1988; 10:294–301. 39. McGregorJA, MacDonald DG. Spread of squamous cell carcinoma to the nonirradiated edentulous mandible-a preliminary report. Head Neck Surg .1987; 9:157–161. 41. De Freitas V, Madeira MC, Toledo Filho JL, Chagas CF. Absence of the mental foramen in dry human mandibles. Acta Anat (Basel). 1979; 104(3): 353-355. 43. Feritas V ,Madeira MC,Teixeira Pinto,C, Zorzetto NL.Direction of the mental canal in human mandibles.Austr.dent.J.1976;21:338-340. 44. Arzouman MJ, Otis L, Kipnis V, Levine D. Observation of the anterior loop of inferior alveolar canal. Int J Oral Maxillofac Impl .1993; 8 : 295-300. 45. Ralf J, Radlanski, Herbert R, Souzan L, Richard A, Schneider. Bone remodeling during prenatal morphogenesis of the human mental foramen.European Journal of OralSciences.2004;112:301-310.